On May 18, some 30,000 people gathered at a rally in Crimea ‘s capital Simferopol  to honor the memory of the victims of the 1944 Crimean Tatar deportations  and to demand the immediate resignation of Anatoly Mogilev , the former Ukrainian Interior Minister who is now the chairman of Crimea's Council of Ministers. This Saturday is the 69th anniversary of the deportation of the Crimean Tatars from their peninsular homeland on the Black Sea to the deserts of Uzbekistan and the wet forests of the Urals. The NKVD rounded up almost the entire population and took them to rail stations where they were stuffed like cattle into box cars. In three days over 180,000 people had been expelled from their homes and sent on a long and arduous journey eastward. The official reason for the deportation was the false charges of treason brought against the whole population by the Stalin regime. However, the number of Crimean Tatars that fought with the Germans, about 10,000, was quite small compared to a number of other nationalities that were not subject to wholesale deportation. Upon arriving in Uzbekistan and the Urals the Crimean Tatars were placed under special settlement restrictions. On 26 November 1948, the Soviet government decreed the deportations and special settlement restrictions to be forever. The death of Stalin on 5 March 1953 brought about an eventual end of the special settlement regime and on 28 April 1956 the Soviet government freed the Crimean Tatars from these restrictions. They, however, were not allowed to return to Crimea in any significant numbers until 1987 near the very end of the Soviet regime. Even today they still face obstacles to resettling in their homeland and nearly 100,000 still remain in Uzbekistan. 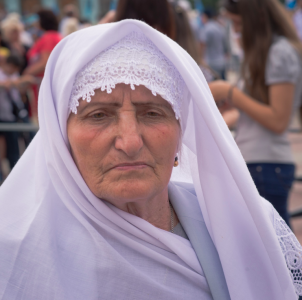 A Crimean Tatar woman at the May 18 commemoration of the 1944 Crimean Tatar deportations. Photo by Andy Ignatov (used with permission). […] Despite the fact that the Crimean Tatars were fighting in the ranks of the Red Army and participated in the guerilla movement, the basis for their deportations was an accusation of collaboration with the Third Reich. Those Crimean Tatars who were fighting in the Red Army units, were also deported upon demobilization: in 1945-46, 8,995 Crimean Tatar war veterans were exiled […]. […] Crimea differs from the rest of Ukraine because it is the only autonomous republic with its own unicameral parliament (with 100 members) and Council of Ministers, thus having a similar institutional structure to that of the Ukrainian state. Under all previous presidents of Ukraine, the planning of this May 18 Crimean Tatar Remembrance Day of Victims of the Deportation event had received considerable support from both the Crimean and the Ukrainian authorities. In fact, during these commemorative gatherings, alongside the Mejlis officials and the mufti (religious authority) of Crimea, a representative of the Ukrainian president, the head of the Crimean parliament, and the head of the Ukrainian Orthodox Church of Kyiv Patriarchate (UOC-KP) participated in the ceremonies. In 2013, however, under Anatoli Mogilev, the chairman of the Council of Ministers in Crimea, the governmental attitude to the Day of Remembrance has changed drastically. Mogilev was appointed by President Viktor Yanukovych in November, 2011. Insisting that he was ill, he opted out of the May 18 gatherings in 2012, marking the first time a Crimean leader did not participate in this event. Even before his appointment, Mogilev was well-known in Crimea for his anti-Tatar sentiments, his brutal order of police units (BERKUT) to attack peacefully protesting Crimean Tatar business owners in the Ai Petri hills in 2007 while he was a police chief, and his subsequent Krymskaya Pravda article (2008) in which he praised the Joseph Stalin–era deportation of the Crimean Tatars (http://www.unpo.org/article/10968 ). The May 18 commemoration of the 1944 Crimean Tatar deportations. Photo by Andy Ignatov (used with permission). […] They say, there were 35-40 thousand people, and, looking at this photo, I tend to believe this. According to various assessments, there are 270 to 340 thousand Crimean Tatars living in Crimea. It means that every 8th [Crimean Tatar] is present at this rally. When I saw this photo, I stopped worrying about the [Crimean Tatars’] future. What can some gang [the regime] do to a nation whose every 8th representative voluntarily attends a rally devoted to national solidarity and national revival? A nation like this will overcome any kind of trouble. As for the Ukrainians’ future, I still worry about it. 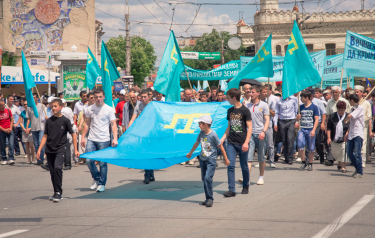 More photos of the Crimean Tatar May 18 rally – by Andy Ignatov , Volodymyr Prytula , and Smail Tantana .